At least for the next couple of decades, the number of people in space at any given time is likely to remain a handful. In the next decade the number of 'Murricans up there at any given time may be in doubt, sad to say. I will bend my rule of avoiding politics here enough to say that it should be no surprise that an administration and party that have screwed up everything they touch on Earth should screw up outer space as well. Past midcentury we can hope and expect something better than that, but the number of people in space may grow quite gradually through this century. Practical spacelift is likely to remain expensive because it remains near the limit of the practical: We can just do it. Nor is there a practical role - yet - for very many people up there. The ones who do go up there will be much more productive than imagined in the rocketpunk era, a space station crew of ten doing the work that a crew of 100 would have been needed for in rocketpunk. No tech revolution is needed for substantially cheaper orbit lift. What is needed is traffic demand sufficient to keep a dozen or so fully or mostly reuseable spacecraft, probably two stages to orbit (TSTO), flying on a weekly or at least monthly schedule. That is about the minimim needed for production and operating efficiencies - say, 100-500 launches each year, each one carrying perhaps 5 tons of equipment or 5 passengers to low Earth orbit (LEO). Supposing that 80 percent of launches are freight payloads, total annual traffic to LEO each year is thus in the range of 400-2000 tons and 100-500 people. This is a lot! Current world demand for orbit lift is less than 100 tons to LEO each year (equivalent to about 20 tons to geosynch orbit), which is why we don't already have a space transportation system like this. No one buys trucks and buses that will run mostly empty. That is why space growth is likely to be gradual - taking off at the critical point at which launch demand justifies economies of scale. At a guess, the transport system outlined above might cost $25 billion per year to operate, corresponding to a lift cost of $5 million per ton or passenger in the early years - compared to some $20 million now - and falling to $1 million per ton/passenger as the transport system matures. For comparison, the current NASA budget is $17 billion. 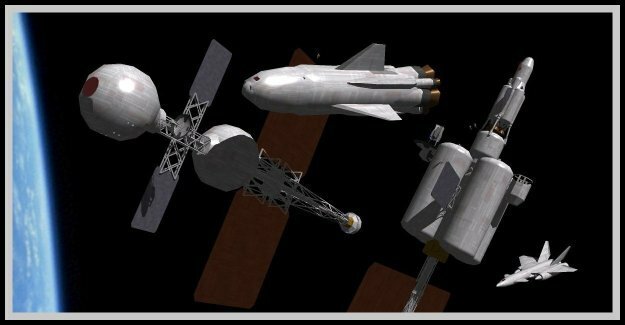 Supposing that a third to a half of total space spending is on the orbital transport system, about three or four times the NASA budget, from all sources, is needed for a space effort large enough for efficient transportation. Note that nationalistic competition in space may help in the short run but probably hurt in the long run. On the one hand, nationalist hype fuels budgets, at least for a while. On the other hand, if everyone wants their own orbital transport system, the efficiencies of scale needed for an efficient one get strangled in the crib. This is more or less what happened in the first Space Age, resulting in a burst of progress followed by relative stagnation. A plausible outcome might be two or three launch services worldwide, each run by some bloc or consortium. Militarization of space, all too plausible a prospect, is a fast trajectory to stagnation. One thing they had most wrong in the rocketpunk era was the presumed high-ground advantage of spaceships against forces on a planetary surface. Spacecraft in low orbit are exceedingly vulnerable to 'ambush' by surface-launched antisatellite missiles (ASATs). These do not need to reach anything like orbital velocity. All they need to do is loft a kinetic target seeker on a suburbital trajectory, so that the spacecraft slams into it. The target's own orbital velocity does the rest. There are countermeasures, but they are expensive and complicated, whereas ASATs are, by space standards, simple and cheap. War in space, at least between Earth powers, won't be rival interplanetary armadas, it will be waves of ASATS shredding everything in near-Earth space ... and conceivably giving Earth a permanent ring of shrapnel that makes space travel impossible. Orbital shrapnel never fully disperses, or only on a time scale of centuries or longer. But let us suppose that by c. 2050 an efficient transport system is in place, and perhaps 200 people each year are going into space. We can guesstimate the average number up there at any given time. Half the travellers, say, go up for short stays of about a week - in effect as tourists, even if officially they are 'inspecting.' That means on average just a pair of quasi-tourists in space on a given day. The other half of travellers, however, are going up on longer rotations averaging perhaps six months, so typically there are 50 long-term workers in space at a given time. Perhaps half of them, a couple of dozen, are assigned to a space station; another dozen are on the Moon, the final dozen are aboard one or two interplanetary missions. By rocketpunk standards this presence is decidedly modest, but it means sending out human interplanetary missions at about the same pace we now send out robotic ones - more or less a mission or two every optimum transfer window. Each will be a comprehensive expedition: That is why you're sending people. Robotic exploration won't cease! In fact the human missions will surely each carry a load of robotic probes as well. The exploration of Mars will not go the way we imagined it in the rocketpunk era. The crew of the first Mars landing won't be looking down from their orbiting ship, scouting out possible landing points for the first time. They'll be making the final judgment call after decades of robotic exploration that has already begun. Likewise we won't send human missions off at random into the asteroid belt; we will send them to explore bodies already identified as of particular interest. Who will pay for all this, and why? I'll talk about that next post. "....screwed up everything they touch on Earth should screw up outer space as well"
I only half agree with you about the "...screw up everything they touch..." Because NASA has been ossifying for several decades, I'd hold both parties to fault. As far as the slow pace of space launch capablities goes, I think that this would be a case for the deregulation (and end to government monopoly over) the space industry. I'm sure that with greater risk-taking, the higher potential rewards would draw more inovation, eventually lowering costs of per launch faster than our present system can. As long as government begrudgingly tolorates a small, highly-regulated space industry, instead of letting companies subject themselves to market forces, then advancement will remain slow. The first "industry", besides propellent manufacturing, in space may well be universities' research field departments. After all, researching another world has academic endevor written all over it. I think the best way to cut the cost to space would be for a large government to declare it will spend $X per year on launching anything into space with whatever company makes the lowest bid per kg. Payment to be made only for successful launches. Maybe $X/2 to the 2nd lowest bidder & $X/4 for the third lowest would be desirable. Whatever government does this would probably want to confine the bids to companies located in its country, but perhaps several governments could get together on similar offers with bidders located in any of the participating countries. Re: advertizing in space - Does everyone remember the scene in _The Man Who Sold the Moon_ in which Delos D. Harriman wore a button with "6+" on it to a meeting with the CEO of a soft drink company that was a rival to the 6+ company? A product of the 1950s myself, stuck here on Earth - so let's not mess it up too much more.